Just Write About It. : My All-Time Favourite Chick-Flicks. In no particular order, as they're all as equally as fabulous as one another. 10 Things I Hate About You (1999). Director: Gil Junger. 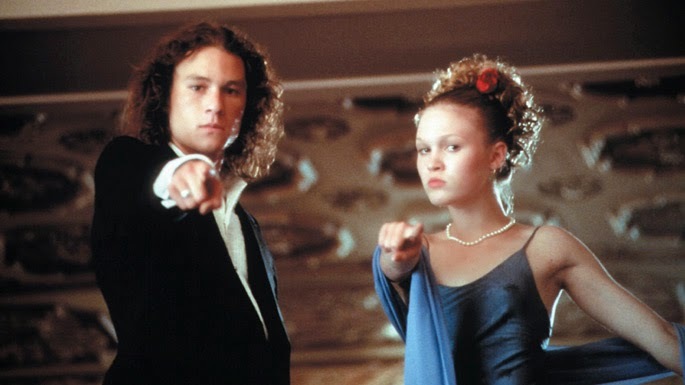 With Julia Stiles and (a very handsome) Heath Ledger, this film is just an absolute classic. Their on-screen love/hate relationship is just adorable to watch. As a nineties baby, this Rom-Com is nostalgic of everything we loved about the 90's. Any prom-proposal that isn't Heath Ledger on a microphone singing "I Can't Keep My Eyes Off Of You" just doesn't compare. Sorry lads. How to Lose a Guy in 10 Days (2003). Director: Donald Petrie. I'm a huge Kate Hudson fan anyway, and so with Matthew McConaughey this film is hilariously cute to watch. We watch along as Hudson drives McConaughey CRAZY by everything us girls have more than likely been guilty of at least one in our past failed relationships. Their romance becomes something to envy by the end - it's just too cute! Mean Girls (2004). Director: Mark Waters. Now this needs absolutely no explanation. Every 90's & noughties child knows this film word for word. Suddenly British kids were very happy to be in secondary school and not in the sassy pool of an American high school. Britney Spears' Crossroads (2002). Director: Tamra Davis. Now if you haven't seen this gem, you have been missing out. Back when Britney was 'the girl next door' this really bad yet really good film was produced and it's amazing. My sisters and I were completely obsessed with this movie. It's the typical American road movie, with a couple of bumps on the way, the three girls re-kindle the friendship they had lost through high school along the way. Romy and Michele's High School Reunion (1997). Director: David Mirkin. I only recently discovered this in 2014 and what a shame that was. I think i've watched it over 3 times since. Lisa Kudrow, betterly known as Phoebe from Friends, and Mira Sorvino star in what can only be described as the first Mean Girls. The two attend their reunion years later and show those plastics who is boss. It's an hilarious journey of two life-long best friends. I definitely recommend this one. Bridget Jones's Diary (2001). Director: Sharon Maguire. It is just one of those films which never gets old. A great Sunday watch, tucked up in your blankets by the fire with a bottle of cheap wine and a block of chocolate, Renee Zellweger portrays everything relate-able to the British female generation. It's funny, romantic and very honest. With Hugh Grant's charming harassment's and Colin Firth's desirable character, this film is the best pick-me-up for those bad days. Bridesmaids (2011). Director: Paul Feig. 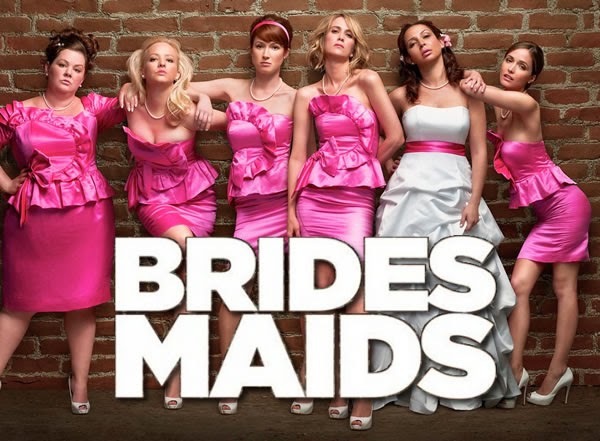 It doesn't feel as though it's coming up to four years since Bridesmaids was released at all. The characters are all easy-to-relate to and although the situation sometimes becomes very dramatic and extreme, it has all the incredients to remind you of your own life. The girl you hate but don't really know, a friend with an amazing relationship, the depressed pessimist... it's just everything to brighten your day up. I never get sick of watching it and love quoting lines from it to my friends. "I'm glad he's single because i'm going to climb that like a tree."